This model is the PP Copy Models 38e Triumph Dolomite in a bluish grey. 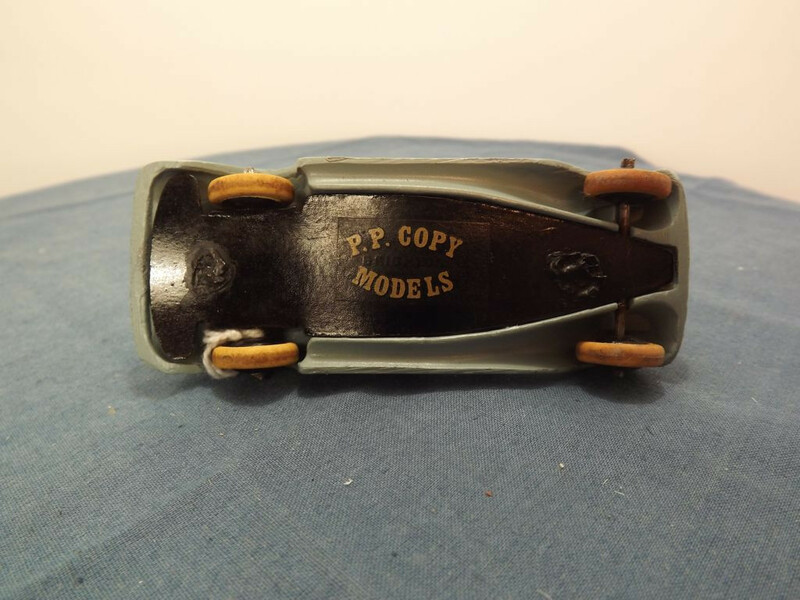 PP Copy Models is run by Ian Law and I believe he is also responsible for models issued under the Past Presents brand. 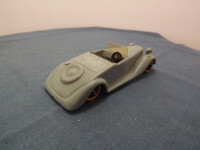 Both brands have produced a number of modern reproductions of Dinky toys plus some in response to collectors' requests for items they believe Dinky should have produced. The 38e Dolomite is based on the Dinky 38e Triumph Dolomite model that was advertised in 1939 and 1940 by Dinky but never issued. This model has been based on the original drawings for the 38e Triumph Dolomite Roadster Coupe (Job 12040) that can be seen in "The Great Book Of Dinky Toys" by Mike and Sue Richardson (pg. 211). 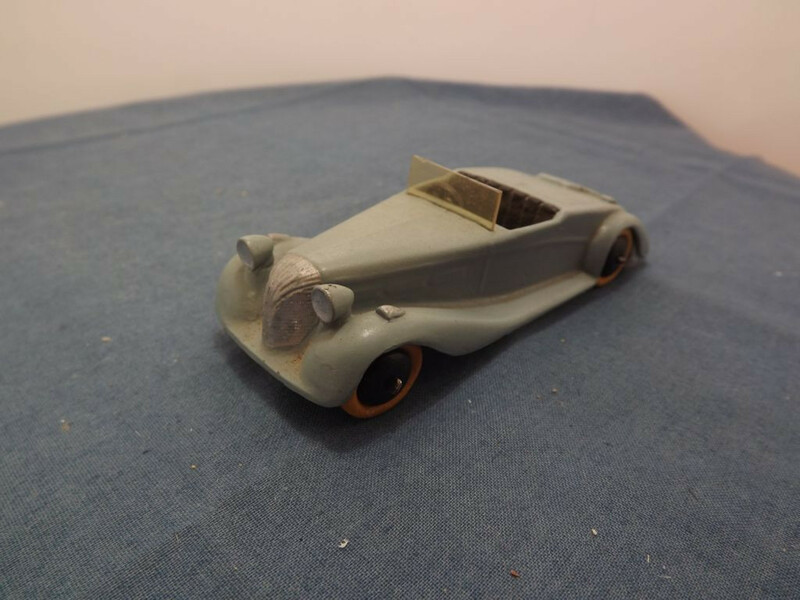 The model has no opening features as it is based on the style of the Dinky 38 series cars. The car is comprised of five castings, the main body , the two headlights, the steering wheel, and the base. The two base and body are held together by two blobs of molten metal. At the front, the grille is cast into the body casting and flanked either side by the headlights. The grille, head light lenses and the tops of the cast side lights are all picked out in silver. There are no cast bumpers. At the sides the doors are cast into the cab area and at the rear the rear doors and hinges are cast into the van rear. The sides there are rudimentary representations of the engine louvres and body trim cast into the body, but no door outlines. To the rear of the car the petrol cap, spare wheel cover and the dickey seat hatch (?) are cast with only the dickey seat handle and petrol cap being picked out in silver. The interior is represented by cast seats, painted black, and a black metal steering wheel, also painted black, that is set into the "dash". The only glazing is a small front windscreen. The baseplate on this model is a plain black shape designed to fit inside the body casting. It holds the front and rear axles in place and carries a small decal that may have a clear background. I say this as teh PP Copy models in Gold is easy to read, but the word "Brighton" in black is only just discernable. There may also be something else in the bottom right corner of the decal but it is illegible on my model. All wheels are of a plain, convex, cast metal type - solid one piece cast metal hub and white rubber tyre, now hard, mounted on steel axles that are crimped at both ends. I do not know when this model was first issued.